1. On the 13th December St. Lucy is honored. She was a 4th century martyr from Sicily, Italy. 2. 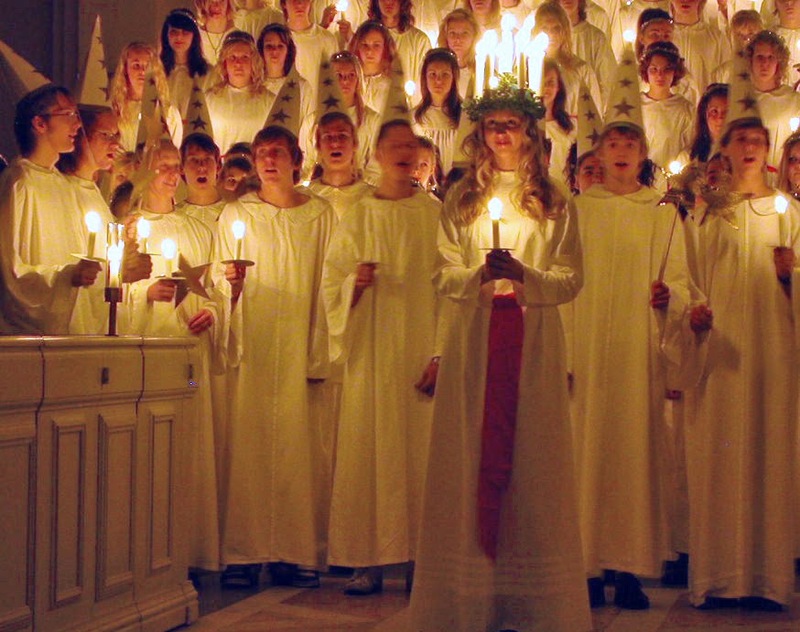 In Sweden and Norway the darkness of the day is broken by the Lucia figure dressed in a gown of white and a wreath of candles upon her head. December 13th was the longest night of the year in the Julian calendar. 3. According to tradition a white-clad woman, wearing a crown of burning candles, appeared at Sweden’s largest lake, Vänern, bringing food to starving villagers during a time of famine. 4. 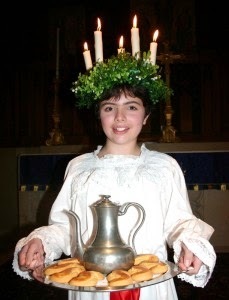 In Sweden and Norway, a girl is chosen to lead the Church procession with crown of candles. Similarly dressed girls (tärnor) and boys wearing a tall pointed hat carrying a star wand (stjärngossar) and follow her. Together they sing beautiful carols (see below) Once the singing is over, the procession enjoy coffee and saffron-flavored buns called lussekatter. 5. In homes the eldest daughter had the honour to be Lucia. She and her siblings woke up the family with their singing. Then the family gathered together with saffron buns at breakfast. Saffron Buns Recipe: Ingredients: Servings: 24 Units: | 300 ml milk 1 g saffron 50 g baker's yeast 150 g sugar 125 g butter or 125 g margarine 700 g all-purpose flour 1 egg salt raisins Directions: 1 Melt butter or margarine in a pan and add the milk and the saffron. 2 Warm the mixture to 37 oC (100 oF). 3 Use a thermometer; the correct temperature is important! 4 Pour the mixture over the finely divided yeast; then add the remaining ingredients (except for the egg and the raisins), which should have a temperature of 21-23 oC (72-75 oF). 5 Mix into a smooth dough. 6 Cover the dough with a piece of cloth and let it rise for 30 minutes. 7 Knead the dough, divide it into 25-30 pieces and form each piece into a round bun. 8 Let the buns rest for a few minutes, covered by a piece of cloth. 9 Form each bun into a string, 15-20 cm long, then arrange the string in a suitable shape, e.g. an S or double S. Regardless of the shape, the ends of the string should meet. 10 Press a few raisins into the dough. 11 Cover the"Lucia cats" with a piece of cloth and let them rise for 40 minutes. 12 Whip the egg together with a few grains of salt, and paint the"Lucia cats" with the mixture. 13 Bake them for 5-10 minutes in the oven at 250 oC (475 oF) until golden brownish yellow. It is traditional in Sweden to sing the Sankta Lucia song with the same melody as the well-known Italian song. Sankta Lucia, Sankta Lucia. The night goes with heavy steps around farm and cottage; round the earth the sun has forsaken, the shadows are brooding.There in our darkened house, stands with lighted candles Saint Lucia, Saint Lucia. The night passes, large and mute now one hears wings in every silent room whispers as if from wings. See, on our threshold stands white-clad with candles in her hair Saint Lucia, Saint Lucia. The darkness shall soon depart from the earth's valleys then she speaks a wonderful word to us. The day shall be born anew Rising from the rosy sky. Saint Lucia, Saint Lucia. 6. Santa Lucia is celebrated all over Italy. 7. In Sicily she is remembered for her intervention during a severe famine in 1582. Miraculously, ships filled with grain appeared in the harbor on December 13. The people were so hungry that they boiled the grains immediately. 8. On this day a most popular dish called cuccia which is made with boiled whole wheat berries, ricotta and sugar. In Lombardy and Veneto, goose is eaten on this day. 9. Santa Lucia brings the presents to children, not Father Christmas. She travels on a donkey on the eve of December 13, and children leave bowls of milk and carrots and hay to attract the hungry donkey and make sure Santa Lucia stops at their house. 10. Children sing for this feast: Saint Lucia, Saint Lucia Fill my stocking with candies If my mother won't do it My stocking will stay empty But with father's money Saint Lucia will prevail.